Love plantain and stew? Then you're sure to love this hearty soup. It's been quite the kitchen-y day. I have not sat down for a second since I crawled out of bed at *cough* 11 am *cough* this morning. When inspiration hits, you just have to get on, right? This is another one of those things that made sense in my head. Thank goodness it wasn't a waste of time putting this together. It turned out fantastic and my taste-buds were grateful for it. When you really think about it, it's not like a lot could have gone wrong with this - it's pretty much a glorified bowl of boiled plantain in stew, only jazzed up with some bright vegetables and shaped into cute dumplings. The flavours are perfectly balanced - a bit of heat from fiery green chillies, sweetness from the plantain, a delicate aroma from fresh lemon grass...Need I go on? Keep reading to discover a new way of eating the ever-versatile plantain. Start by making the soup base. Blend half the red bell pepper with the tomatoes, lemon grass and a little water. Pour into a large pot, add the olive oil and season with salt. Let it simmer on a low heat as you get on with the rest. 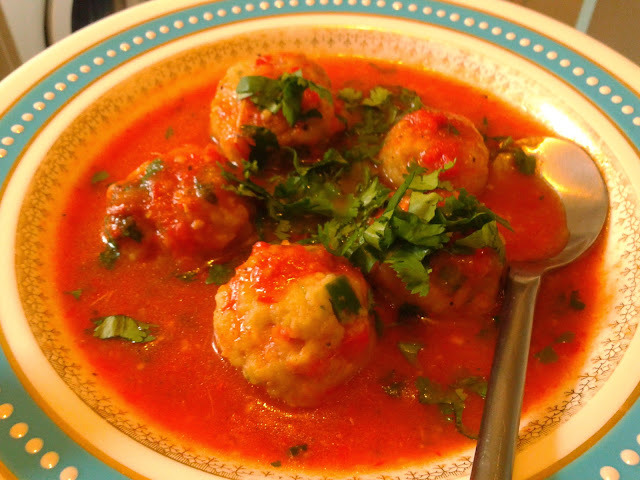 To make the dumplings, blend the ripe plantain with the garlic, chillies (or scotch bonnet pepper) and fresh basil (or partminger) in a food processor to form a smooth mixture. 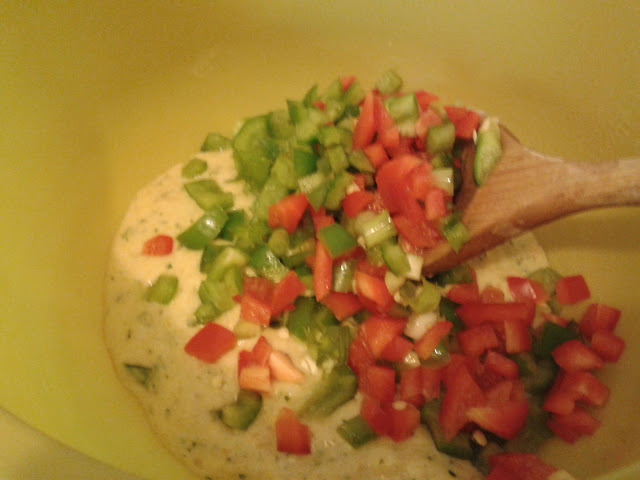 Transfer the mixture into a large bowl and add the chopped green onion, red and green bell pepper, and the flour/breadcrumbs. Mix well to evenly distribute the chopped vegetables. 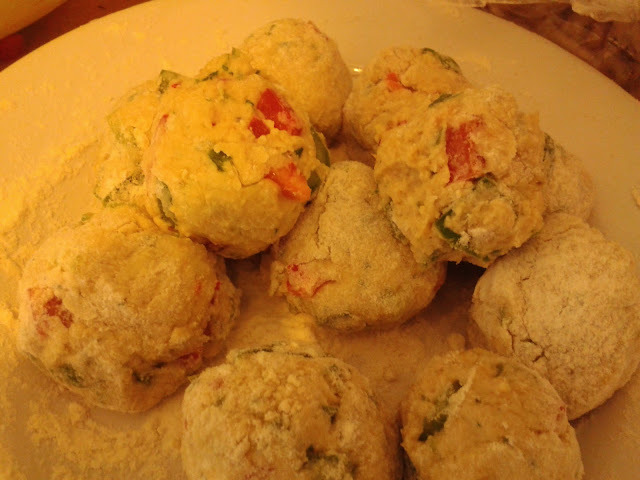 With floured hands, take spoonfuls of the mixture and roll into round dumplings - it should yield about 10-12. Arrange them on a lightly floured surface as you go along. Place each dumpling carefully into the simmering pot of soup. Add 2 cups of water and bring to a boil for 5 minutes. Reduce the heat and simmer for another 5 minutes with the lid off (this will help thicken the soup slightly). Serve hot with a generous garnish of chopped fresh herbs. This reminds me of my days in India, yummy dish you have here and I love plantain, guess I will try it someday. Thanks! Really, India? that's pretty cool. I tried this and it tasted nice except I went a little ott with the flour in the dumplings! Another thing I will try next time is roasting the tomatoes first as it does have a very tomatoey taste when it is just boiled and they are not my favourite fruit.